IN THE PAPERS - Monday April 15: We bring you an explosive investigative report from the website Disclose that shows proof that French weapons sold to Saudi Arabia were used in civilian areas. France is also accused of offering tax waivers to Indian tycoon Anil Ambani around the same time the Rafale deal was being negotiated. Also, the bickering continues between Julian Assange and Ecuador, Tiger Woods makes a great comeback and find out how to pretend to be a Game of Thrones fan! Since March 2015, Saudi Arabia has been leading a coalition of Arab states waging war in Yemen to overthrow the Houthi rebels, a pro-Iran Shiite militia which controls the western parts of Yemen and the capital Sanaa. The war has killed thousands of people, many of them civilians, and humanitarian organisations are now questioning the role played by Western countries, some of which supply weaponry to the Gulf countries. Jean-Yves Nalan reports. FRENCH PAPERS - Tues. 23.02.16: François Hollande's trip to the French Polynesian island of Tahiti is in the spotlight. Meanwhile, back at home, Hollande’s government is facing criticism from the left for a controversial reform to France’s labour code. INTERNATIONAL PAPERS, Weds. 25/04/13: Haaretz explores why the US is so reluctant to back Israel's claims that Syria has repeatedly used chemical weapons. 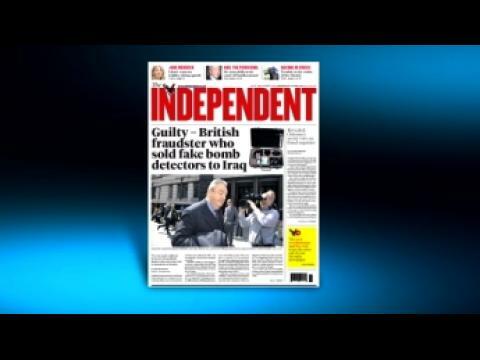 Meanwhile, the Independent explains how a British tycoon managed to trick Iraq into buying millions of pounds worth of fake bomb detectors - a scam with a very tragic human cost. Finally, the Independent says George W. Bush could be on the road to rehabilitation with his new presidential library. The Wall Street Journal Europe reports on what it says is a "trans-Atlantic disconnect" in the Western world's security plan, with a breakdown in communication between Paris and Washington over Mali. We also look at sabre-rattling in Korea, and at the Pentagon's decision to allow US women onto the frontline.